Go with your family and have a good time, enjoy the ride. Every single movie that I have seen from Southern India has impressed me. Whether it be the Bahubali franchise, Makkhi, I, or Robot, I have been blown away by the inventiveness, pacing and sheer creativity of each of these films. Each of them has pushed the boundary of filmmaking in India from a technical standpoint and even better, the filmmakers have not held back in whatever they want to show. In particular, I am a big fan of Shankar’s film Robot from 2010. Starring superstar Rajinikanth and Aishwarya Rai Bachchan, the film was touted as one of the biggest sci-fi extravaganzas ever upon release. Combining amazing special effects and a message driven story, Robot was the tale of a creator and his creation. When the creation begins to exhibit human like emotions, it doesn’t take long for the film’s villain to sway the main robot, Chitti, against his creator Dr. Vaseegaran by playing on the emotions of jealousy and love. What follows is an epic battle between the Dr. and the robot, leading to a bittersweet conclusion. When I heard that a sequel to Robot, to be titled 2.0, was in the works, I was super excited. I knew that the ante would be raised in every way from casting, to story, to special effects, and I simply could not wait for it to be made. My excitement doubled when it was announced that Hindi superstar Akshay Kumar would play the villain in the film. This would be the coming together of 2 acting titans from India’s biggest film industries, producing what is essentially a pan-Indian film. Although I was disappointed that Aishwarya would not be back for the sequel, I was pleased that Amy Jackson would be in it. In terms of story, 2.0 is a direct continuation from its predecessor. When cellphones start disappearing in India, followed by some odd and gruesome killings of politicians and cell phone company leaders, Dr. Vaseegaran (Rajinikanth) is assigned to help find a solution to the problem. When a giant bird, made of cell phones, attacks a city, there seems to be only one solution to combat the supernatural evil – the re-release of the robot Chitti (Rajinikanth in a double role). The bird is discovered to be a man named Pakshi Raja (Akshay Kumar). Just exactly who is he and why is he seeking to destroy humanity? How did he develop his supernatural powers? Is he truly evil? Will Chitti be able to stop him? To find out the answers, watch 2.0. From a performance standpoint, neither Rajinikanth nor Amy Jackson have roles that require a range of emotions. Whereas Dr. Vaseegaran is a perfunctory scientist, both Chitti and Amy’s character Nila, are robots. They only smile, crack monotone jokes, and take part in action scenes. For this, they are fine, but obviously nothing ground breaking. Having said that, Rajinikanth is presented like a superstar and in terms of that, he does not disappoint. If there is anyone who should be applauded in the film, it is Akshay Kumar. He plays the only character with depth, and he succeeds in giving his character multiple layers. He is not outright evil, but rather a grey character who has clear cut motivations for why he is doing what he is doing. Akshay seems to be enjoying the role, and that deep dive of immersion in the part is perceived every time he comes on screen. He is menacing yet sympathetic at the same time, comparable to Hollywood villains such as Sandman in Spider Man 3 or Mr. Freeze in the Batman pantheon. Director Shankar has written the story and script for the movie, and has done a decent job. I will say that this film is not about strong script or story at all, yet its message resonates in an interesting way. With its message about cell phone radiation, its impact on birds and the ecosystem, and on our own personal living habits, Shankar utilizes both depressing imagery and humor to make his point. Without revealing anything, the reactions of people after losing their cell phones has very strong doses of dark humor, making audiences realize how much we rely on our phones and to what extent that has impacted our social relationships and values. The scenes depicting cell phone impacts on birds will make you emotional. There is a lot of complex scientific jargon in the movie, which I am not sure whether it is authentic or not, but it makes for interesting viewing. It, at the very least, sounds convincing. There are no real songs in the movie, which I actually think is a blessing. Although A.R. Rahman is amazing, I believe songs hamper a movie’s narrative, especially if it is an action movie, and I think it is great that time is not wasted on this staple of Indian movies in 2.0. There is one song in the credits which is picturized exquisitely, but it is just a “time-pass” song. Shankar has directed this movie wonderfully. For the most part, it moves along very quickly and has a consistent dose of action sequences. There is no silly love story, no melodramatic emotions. It just gets right to the point and is relentless after that. You could tell that every frame is oozing with the director’s passion to make an extravagant film for audiences, and I think Shankar has excelled in that realm. The special effects are the best I have ever seen for a movie in India. 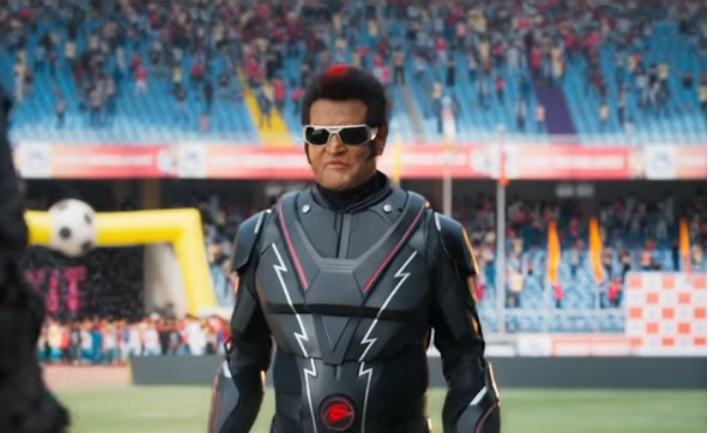 From the sequences depicting the giant bird, to the attack of the cell phones, to the confrontation scenes between Chitti and the bird, to the crazy climax in the stadium, 2.0 outdoes every other Indian movie I have seen in this department. For once, an exorbitant amount of money has been spent on spectacle without restraint or compromise, and that is a visual treat for everyone. I can’t wait for 3.0 to come out, because no telling how the envelope will be pushed there! I don’t think any of us are meant to think about these things while watching the movie. It is pure silly fun, and most definitely will be enjoyed by the young and young at heart. It is not a movie for people who are “cinematic prudes.” Go with your family and have a good time, enjoy the ride, that’s it. I will go with a 3/5 for this one. I would give it higher, but the pacing drop in the 2nd half annoyed me too much, and I view that as a very big flaw. If you see it, make sure you see it only on the big screen!